Complex analytics which involve widely diverse data sources are the forte of Alteryx. The platform is easy to use and extremely practical in its application to business problems. It avoids the unnecessary complexity of many other alternatives, while providing sophistication that is not available in most data visualization and business intelligence platforms. Alteryx is an interesting product, filling a void that most other analytic platforms do not address. It allows skilled business users and analysts to analyse their data using a combination of data visualization and predictive analytics tools. It also supports spatial analytics where location is important. Alteryx places a great deal of emphasis on the ease-of-use of its platform and the creation of workflows via a drag-and-drop graphical interface. Resulting analysis can be shared, both the analytic models and the results of analysis. Virtually all commonly used data sources are supported, and via a process of data blending users can shape data into the form they need for analysis. Various analytic techniques can then be applied to the data, and the results output in visual formats and/or formats which can be consumed by other tools (e.g. Tableau and QlikView). Alteryx is not primarily a data visualization platform, and so is not in the same genre as most business intelligence platforms, where predictive analytics and other more sophisticated forms of analysis are not supported. In a nutshell Alteryx is an advanced analytics platform that has been made approachable through its user interface, and where the results from analysis can be easily shared. Alteryx is primarily used in medium and large size businesses, and enables a wide variety of analytics applications. A global specialist in energy management would spend considerable amounts of time deciding how to deploy its sales resources, and always the analysis would be incomplete and late. This firm used Alteryx to integrate data from many resources so it could identify high potential customers through the use of various analytical methods. The resulting benefits of much faster and more accurate placement of resources came not only from the analytical capability, but also from the collaboration that was supported in the Alteryx platform. A large business that provides marketing services to its customers needed to speed up its analysis so that these same customers could target their markets in a more accurate and speedy manner. One of the bottlenecks was associated with the diversity of customer data that had to be analysed, and the data blending and transformation capabilities of Alteryx significantly reduced the time required to do this. The results of analysis could also be presented in richer formats and shared more easily. A premier independent institutional brokerage and investment banking firm needed to process diverse heterogeneous data sets, and the time taken to preprocess this would often take several weeks. Alteryx was used to process and blend the data, and process it using advanced analytics methods. The output could be fed directly to Tableau for data visualization purposes. The result is a drastic reduction in time and cost in supplying analysis to its clients. There are many other applications of Alteryx, and the outcome is typically much reduced lag between need and solution, and reduced cost of analysis. 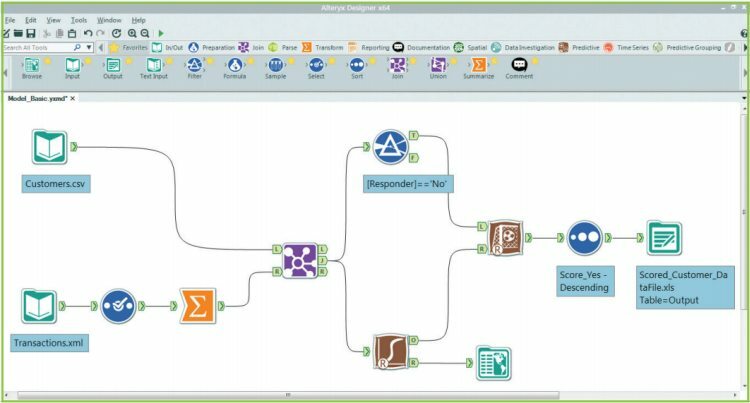 Alteryx Designer is a desktop application which enables an analyst to blend data from a large number of sources in a way that is straightforward and intuitive. The data can be easily shaped for a variety of analytics tasks, and specifically predictive analytics, statistical analysis, and spatial analytics when location is important. Supported data sources include internal (e.g. MySQL, Oracle, SQL Server, Cloudera, MapR, Excel, Acces and a long list of others), cloud based data (e.g. Salesforce, Facebook, Twitter, Foursquare), and third party (Experian, TomTom, D&B etc.). The analytical tools are based on the open source R platform with logistic regression, decision tree, clustering(K-centroid), principal component analysis, and visualization tools such as scatter plots and association analysis. The spatial analysis extends to geocoding, trade area creation and analysis, drive time analytics, mapping and geographic visualization. A variety of outputs from analysis are supported to create customer reports in the form of tables, charts and maps. Other formats can be directly consumed by Tableau and QlikView. Alteryx Server provides similar functionality with support for large scale analytics in a server environment. It also facilitates the central storage of workflows and the results of analysis so they can be shared and easily distributed. The analysis workload can be scheduled for regular remodeling. The Alteryx Gallery is a cloud based facility which supports the sharing and consumption of workflows and reports via a web browser, and as such is available on mobile devices.